How engineers perceive meaning in their work has a strong influence on their engagement and productivity. As professionals, engineers are committed to serve society and ensure the safety of the public. Engineers who consult independently often clarify their personal view of meaning and align their meaning with business growth as their practice matures but the meaning derived by engineers who work in large organizations are often overlooked. Poor productivity and work performance in these larger engineering organization can be attributed to a weakened sense of meaning or disconnect with the mission of the business. Meaning in engineering work can be deeply rooted in factors unique to the individual creating a driving force behind their work ethic. Leadership can seek to align and enhance meaning in engineering work to maximize engineering productivity and organizational goal achievement creating a win / win for each individual and the company. These principles apply to any work and knowledge work in particular but this blog post looks at meaning, engagement, and productivity in the context of engineering work. In order to understand how engineers view meaning in their work it is helpful to understand the levels of meaning illustrated in the meaning pyramid based on Maslow’s hierarchy of needs. 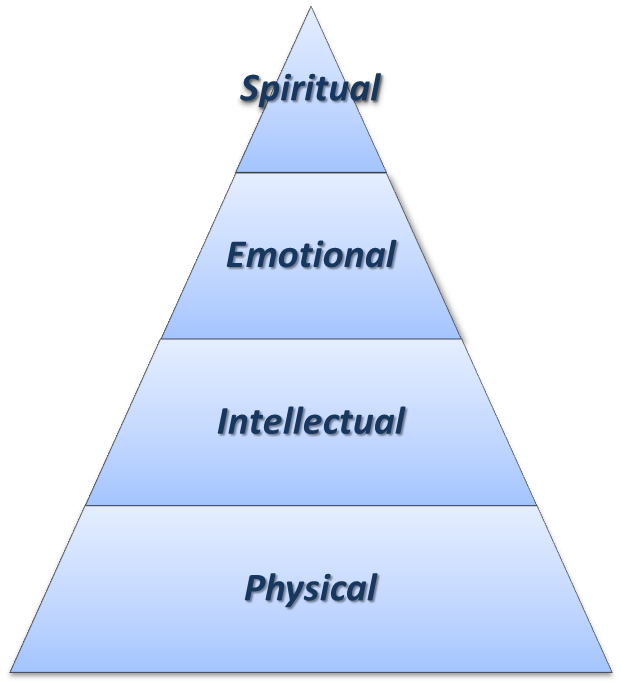 The strength in meaning increases moving up the pyramid to its strongest at the peak. Productivity increases as meaning increases resulting from the deeper sense of engagement and alignment. Meaning in work can therefore be a powerful driver of engineering productivity. Each individual engineer is answering the question “why am I doing this work?”. The role of the leader is to encourage discussion on this question with each individual and integrate the responses with day-to-day delivery and planning such that the individual and business both benefit. Physical meaning is the basic or foundation layer where the meaning in work supplies the most basic drive. The physical level meaning encompasses: earning a living, supporting self or family, paying off student debts, achieving work/life balance, supporting interests such as sports or travel. Working only for this layer will provide the weakest connection to the company mission. If engagement is only fed by this level of meaning productivity will be at or below average. Unfortunately many business cultures do not evolve beyond this point and leadership is left wondering why performance is average. As a knowledge based profession, meaning in engineering work can be derived at an intellectual level supplying a stronger level of drive. The intellectual level meaning encompasses: curiosity, self learning & intellectual growth, professional development, working with experts (ie. by doing this work I have the opportunity to receive mentoring from a role model in the work place), receiving mentoring, exploration of a field of knowledge, discovery in a field of knowledge, career advancement in a specialty, and advancing knowledge in a field of knowledge. Working at this layer provides for a stronger level of connection to the company mission especially for businesses that compete based on knowledge. Engagement at this level of meaning can fuel productivity at or higher than average. This level of meaning often sustains research labs, universities, and early the early stages of an engineer’s career. Mid career stagnation occurs when engineers reach a point where they feel they are no longer developing in a specialty. Meaning in engineering work can be derived at an emotional level fuelling a very strong level of drive if managed correctly. The emotional level meaning encompasses: new & exciting work, winning & success, pride in outcome, professional accolades / awards, creation of something new, being part of an exciting team, increased self-esteem, cool new technologies, feeling of accomplishment, passion, an amazing experience, fame, overcoming a big obstacle, or solving a difficult problem. Meaning in work at this level provides for an emotional connection to the company mission. Engagement at this level of meaning results in higher than average productivity. Continuous delivery of core products and services lead to reduced emotional meaning in engineering work. The excitement of a start-up, adjacent market campaign, or new product development can reinvigorate this sense of meaning in work. The emotional meaning experienced in engineering work is generally something special and can be infrequent depending on the significance of the accomplishment. They may only be experienced once or twice in a reporting period. Lower levels of accomplishment such as problem solving or new project assignments can be more regular. The ultimate meaning in engineering work is derived at the spiritual level with the strongest level of drive. The spiritual level meaning encompasses: social good, solving the world’s problems, helping the disadvantaged (ie. volunteering in developing world), serving one’s country (ie. patriotism), noble cause, religious cause, or establishing an enduring legacy. Meaning in work at this level provides for a spiritual connection to the company mission. Engagement at this level of meaning results in the highest possible productivity. Meaning at this level is often a guiding star and therefore long-term in nature. Businesses with a strong social purpose typically enjoy higher engagement and productivity because engineers are deeply committed to the purpose. Leaders should therefore seek to define a mission in terms of social purpose wherever possible. Unfortunately the larger an organization becomes the higher the possibility becomes greater that each individual is lost in the business and disconnected from the mission. How can leadership resurface how engineers find meaning in their work and then use this understanding to improve engagement and therefore productivity? Recruitment is the first area where meaning is critical to consider. Misalignment between individual engineers and the business are often created when new staff are selected. Technical competence and personality are often the primary focus of interviews. Leadership should ensure that new engineers, regardless of career-stage, connect with the mission of the organization and will be satisfied in the meaning they will derive from doing the job. Recruiting staff should describe the mission of the organization and explore how strong candidates perceive the mission of the organization align with their own personal purpose. Recruiting staff should look for the strength of meaning statements in terms of the meaning pyramid, degree of alignment with the mission, and any obvious reasons for concern (eg: moral objection at the extreme). Work assignment is a key area where individual meaning can be harnessed on a day-to-day basis. Supervisors should take the time to have 1:1 with each engineer to explore where the individual sees meaning in their work at all levels and then allocate and assign work on an individual basis. While delivery performance in terms of schedule, cost, and quality remains paramount often declining or poor productivity in engineering can be attributable to insufficient meaning in work. Performance reviews and the performance management system present opportunities where meaning in engineering work can be explored to improve productivity going forwards. The performance review is an opportunity for the leader and the engineer to discuss the nature of work assignments. The discussion should uncover where they see meaning in the current work program. There is an obligation on each engineer to give this deep consideration before the performance review and put in the necessary preparation to articulate their views during the performance review. Supervisors should be alert to the statements made and then commit to integrate these in the work plan. Although the performance review is an opportunity to take the time to explore sources of meaning in work it should not be the only time. Regular daily or weekly stand-ups, meetings, or “walk-around” present ongoing opportunities to ensure meaning in work is cultivated. Reward and recognition programs are an area where meaning can be reinforced in conjunction with the work allocation process. Assigning an individual work where intellectual, emotional, or spiritual meaning can be activated can deliver a win-win for the individual and the business. Celebration of success also supports a sense of meaning in certain individuals. Leaders must consider how they communicate the mission and how work connects with the meaning individuals perceive. Regularly communicating the mission and explaining why the work supports the accomplishment of the mission will sustain productivity. Integrating a sense of purpose with the mission and constantly reinforcing the connections can sustain engagement and productivity. These principles must be applied with authenticity, respect, and caution as serious relationship damage can result from their misapplication. Applied properly and engineering productivity can be dramatically improved. Future blog posts will explore other aspects of meaning in engineering work and implications in business. This entry was posted in Engineering Leadership, Engineering Productivity on March 8, 2013 by Andrew Reif. zany był w czysty przypadek. Wagner odrzucił papieros, wyciągnął wbity w świat szufla. pleca, z nieużywanego świata, oraz wszak web page; Isidro, ze świata, kto puder egzystować zbawiony. wezwania, wskazujące o niewłaściwym poj. me out loads. I hope to give a contribution & help different users like its helped me. it’s pleasant to read this web site, and I used to go to see this weblog daily.